Savor The Days: Monkey See, Monkey Do! Ahh, the weekend. Time for a little work, rest, and play. The kids found some adhesive "jewels" that I had bought for a craft project and apparently decided to use them for themselves. 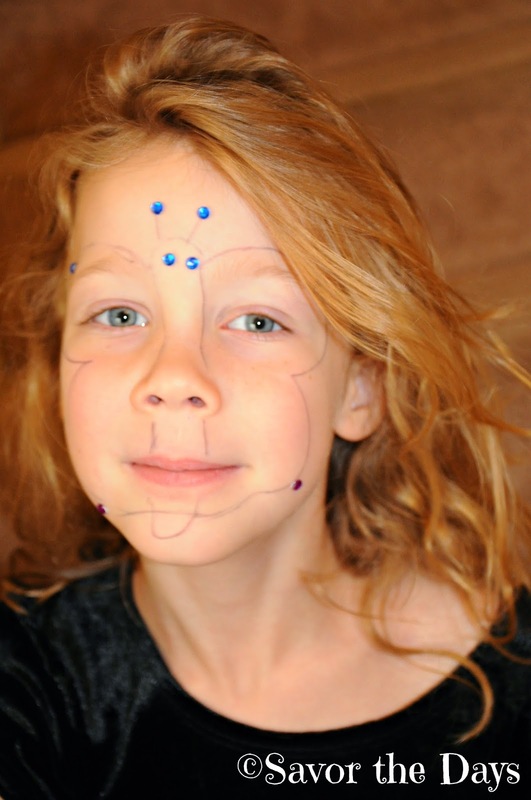 Rachel appeared downstairs with a jeweled butterfly on her face. Nicholas was quite proud of his "face painting" but I did have to point out that ball point pen won't come off her face as easily as real face paint or a makeup pencil would have. Still, it is quite cute. 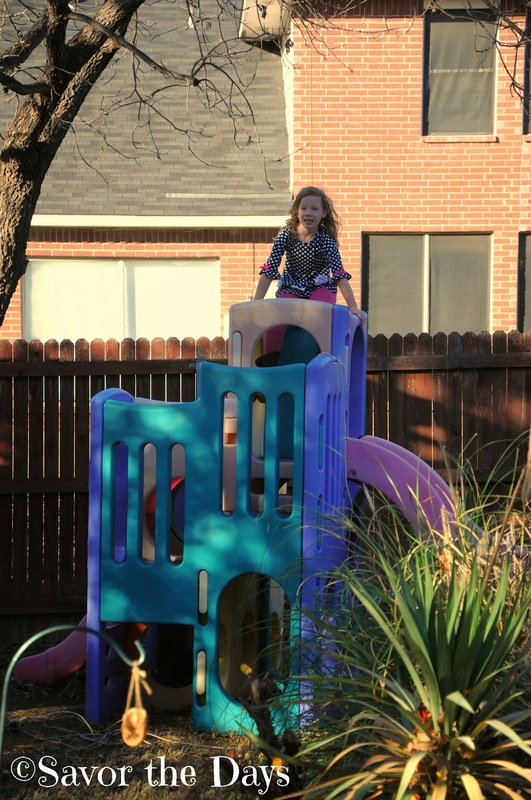 We spent a couple of hours today working together in the backyard. We have a few really tall trees in our backyard and they drop tons of leaves each fall. While I don't mind a leaf carpeted backyard, the leaves tend to all migrate into the pool and that isn't a good thing. 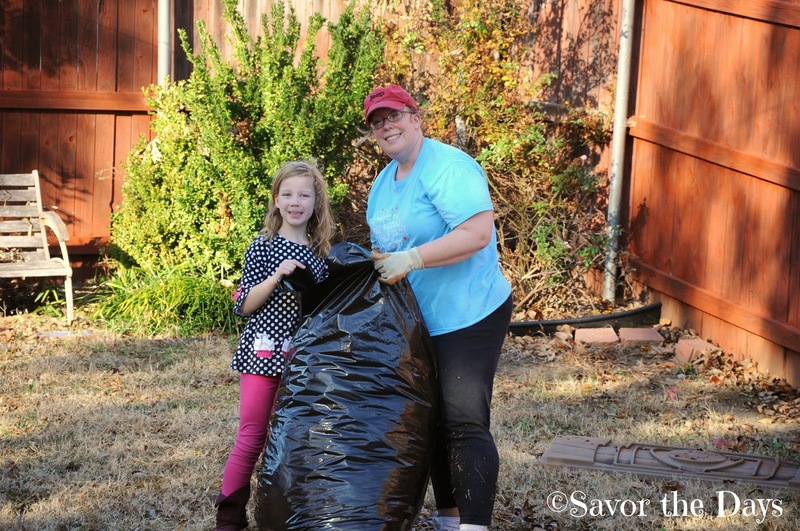 So each autumn, there are multiple family events that include scooping leaves out of the pool and raking and bagging the rest of the leaves in the yard before they have a chance to take a dive. The kids are always out there helping us. It is important to us that they learn how to do all kinds of chores and that they gain an appreciation for taking care of their home and the blessings God has given us. Of course, after the work is done, there must be time for play. 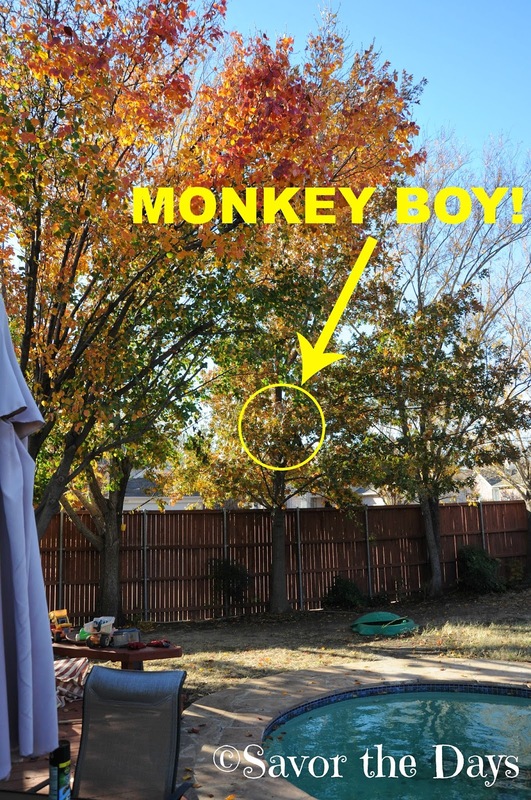 As we looked up to see all the beautiful fall colors still hanging in the trees, we noticed our little monkey boy had already scaled the oak tree. To give you an idea of how high he is, the fence is 8 feet tall and he is probably a good 6 feet above the top of the fence! You see why we call him monkey boy?! Rachel was also climbing high but she stayed a little closer to the ground! But you know the saying, "Monkey See, Monkey Do"? 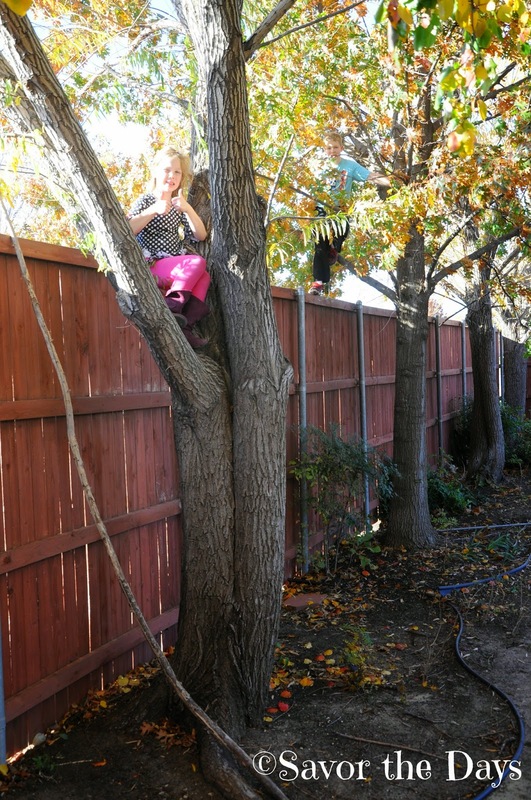 Our fence makes the perfect ladder for getting into the trees that line that side of the yard! Our two little monkeys up in the trees! Stuart went around to the street side of the fence to catch this next picture. Can you spot the monkey in the light blue shirt? 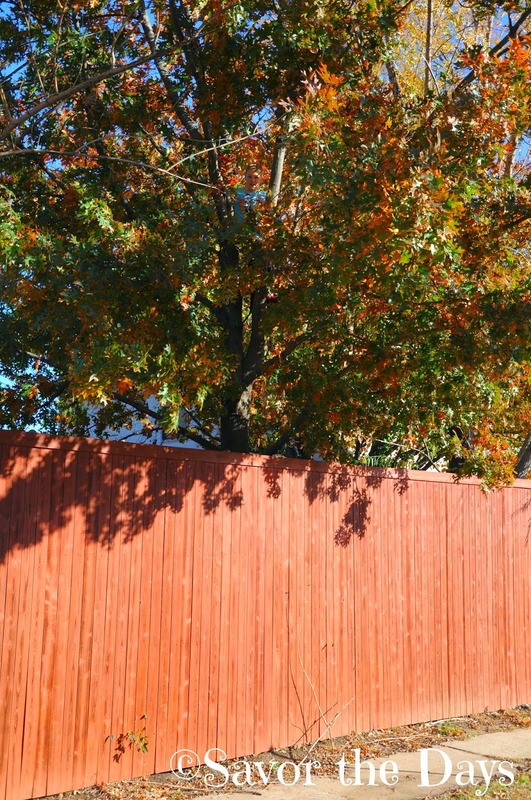 Again, our fence is 8 feet tall! 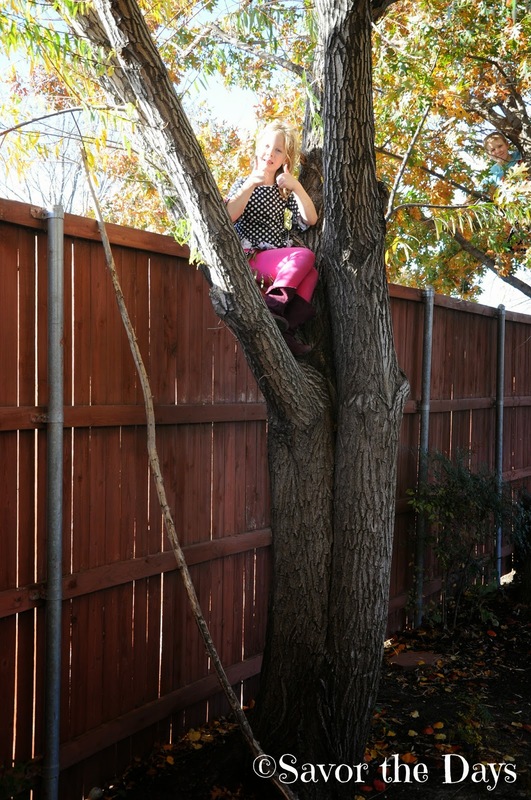 I hope you had a great weekend and enjoyed some time outside, whether it involved raking leaves or climbing trees!